There are not any pros when I think of this product compared to it’s competitors. I researched a few other call tracking solutions and all were better and cheaper. Their competitors are 75-90% cheaper and offer more reporting, data, functionality. There are better models with better customer support out there. 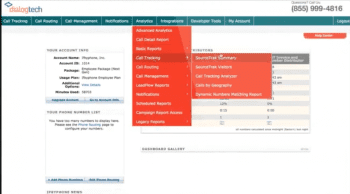 Our company used DialogTech for call tracking services for multiple clients. The interface and reporting could definitely use new updates and are not that user-friendly. Customer support is also limited, with no live chat function – you need to call their main line when needing any support. For the price, there is better software out there but it does integrate with platforms like Google Analytics. We have used this for a couple years for our service tech IVR line. I have never had an issue with calls not going thru. Would definitely recommend. We use the IVR function of this service to route our calls to various departments. They have many other features you can add on as well. With a strong focus on delivering actionable insight to marketing teams everywhere, DialogTech has been serving businesses since 2007. 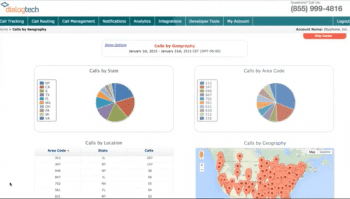 DialogTech provides businesses that value inbound phone calls as a priority with actionable marketing analytics. With a large product offering ranging from call attribution tools to AI & Machine Learning, DialogTech delivers the information that marketers need to analyze, attribute, and ultimately optimize phone conversations. With Headquarters located in Chicago, IL, DialogTech is capable of servicing all of the United States, and even provides international phone numbers for businesses with an overseas presence. With DialogTech, businesses are able to optimize individual phone calls much in the same way they would optimize clicks, to deliver the highest ROI and revenue possible. With their roots dating back to 2007, DialogTech has an established history in marketing analytics solutions, and still stands strong as a solid choice for a business that’s looking to ultimately optimize every single phone call contact in any way possible. In contrast to other providers in this market, DialogTech makes it possible to build out a complete solution with a wide array of tools and solutions, including call attribution, conversation analytics, in-depth routing, and machine learning. DialogTech can offer a unique package almost unrivaled on the market today. Overall, DialogTech’s main focus is on delivering and providing the tools necessary for a business to gain actionable analytics from their marketing campaigns, specifically for businesses that focus on and utilize inbound phone calls. With in-depth call attribution tools, businesses can increase their ROI with new in-depth insight into how marketing campaigns are generating leads. But with their wide range of tools available, beyond just call attribution, DialogTech provides everything a business would need to turn phone calls into revenue, and to optimize their ROI on marketing campaigns and efforts. These unique solutions also enable your business to completely optimize the customer journey, by providing your business with complete control over the entire system that callers will be interacting with. Robust features like DialogTech’s unique Conversation Analytics helps businesses better understand which calls are quality leads, and which calls might need extra attention. Voice and Text notifications allow your business to deliver important information to customers quickly and easily, including customer alerts, appointment reminders, phone surveys, and reorder reminders. 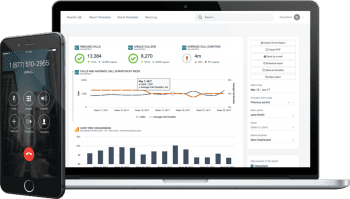 With powerful features including keyword call tracking, dynamic number insertion, website visitor tracking, caller profile data, reverse lookup, call recording and transcriptions, DialogTech offers a truly complete and comprehensive marketing analytics platform. Whether your business is a small operation looking to better understand how their marketing efforts generate leads, or a large Enterprise in need of a state of the art call center solution, DialogTech is a strong option. What Do You Think of DialogTech?